If you are looking to go mountain biking somewhere special this winter season, Tarifa is definitely the place to be! A week of Mountain biking holiday in Tarifa in the south of Spain at the Strait of Gibraltar, opposite Africa is exciting. 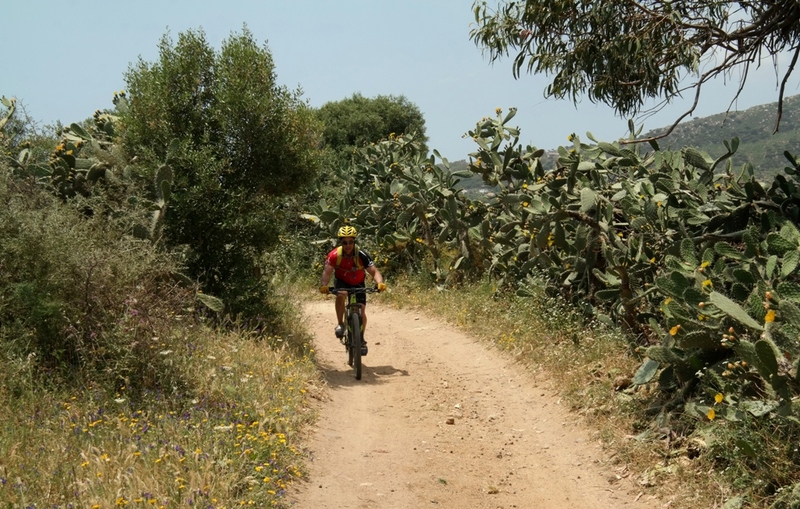 Biking every day fantastic routes with local experienced guides who will bring you to the best mountain bike trails, downhill tracks and to typical Andalusian tapas bars around Tarifa for a break. This is a fantastic holiday week of biking for mountain bikers who want to discover something new and enjoy mountain biking in the purest form. Tarifa is one of the best-kept secrets in the bike world. For Who: Mountain bike Addicts! XC, Marathon, Enduro and Downhill Mountain bikers. What is so special: The views over the strait of Gibraltar and North African coastline, beautiful scenery, encounters with wildlife (birdwatching), biking hidden DH tracks and very attractive trails to challenge. Tarifa is a true biking paradise. Guides: Experienced local mountain bikers (Andy of ridetarifa, Ludo of bikingtarifa or Henk of mtbtarifa) who knows the area better then anyone else and we will bring you to places where others do not go and give technical assistance if needed. It´s all about enjoying good times and nice routes. Bikes To Rent: Hardtails: Specialized Rockhopper 29er, Cannondale Trails 4 sl. Full suspension: Canyon Nerve 6.0., Specialized Enduro 2015, Cannondale F29. All bikes are checked before and after each ride by professional mechanics. Also bycicles for ladies and kids available. What to do after a nice route: You can relax the legs at one of the chiringuitos, visit the intact Castle Guzman el Bueno or visit the beautiful bay of Bolonia and the roman ruins of Baelo Claudia, Go whale watching with Turmares, Stand up paddle surf with sunset and treat yourself with the best tuna fish or iberian pig (specialities) in one of the restaurants or tapas bars in the old town. Never a dull moment. Includes: Helmet, Pump, Repair-Kit, Bike Map and Guide. Not included: Bike, Accommodation, insurance, drinks and food at stops. You can bring your own bike! Bikers must be in good physical condition and know their own limits. Groups: Depending on the size of the group there will be 1 or 2 qualified experienced guides with outdoor first aid certificate. Accommodation in Tarifa: Choice of accommodation is varied in Tarifa, you can stay overnight in one of many modern hotels, pitch your own tent on one of the camping sites or choose for your own private holiday home with a sea view. Contact Henk for more information on mountain biking week in Tarifa. I’ve been an avid mountain biker for over 20 years, riding and racing on tracks all over the US and in the Alps of Germany, Switzerland and Italy. In all this time, never have I experienced such a wide variety of terrain and scenery in one place as Tarifa! I rode with Henk and Mark (MtbTarifa) for 5 days and felt as I only scratched the surface to what this wonderful MTB playground has to offer. One of the best things about Tarifa is that it has something for everyone – from rocky climbs through goat trails, to fantastic oceanside trails, to jeep trails through the forests that pass by God’s creatures of all sorts. I will be back, sooner rather than later!